I heard on Twitter this afternoon that poet Maxine Kumin has died. I only dabble in the reading of poetry, so I can't claim any big knowledge of Kumin as a poet. 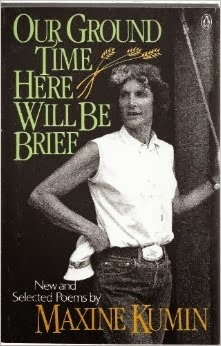 (Though I will stick out my neck and say that that is one damn fine cover on her book, Our Ground Time Here Will Be Brief.) I feel a very tenuous connection with Kumin, though, in a ships-passing-in-the-night sort of way. I have probably told a variation of this story here before, and I definitely have at The Millions. When I was in college, I worked summers at the Bread Loaf School of English and Writers' Conference. One year, Anne Sexton dropped by during the writers' conference to visit her friend Maxine Kumin who was there. I, though an English major, didn't know who either of these women were. So during Sexton's reading, I went swimming with friends. It wasn't until she died soon thereafter that I realized her significance. This is the story of my life, folks. I often don't quite get with the program. Just miss the boat. Probably wouldn't have run for the gangplank if I'd realized it was about to leave without me. Maxine Kumin was also an essayist, and I have stumbled upon a couple of her pieces in New England publications. Right now I'm feeling that I'd like to sample some more of those. And guess what? Kumin was 88 years old and has a new book of poetry, And Short the Season, coming out in April. Yes! That Was Exhausting. And Kind Of Mortifying. Have You Seen These Characters? Time Management Tuesday: Objectives Or Systems?